The solar system is littered with clouds of dust--some of them uncharted. Earth might encounter one such cloud this Friday, June 27th. 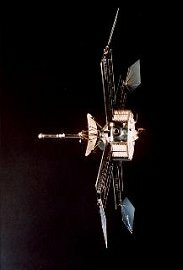 June 27, 2003: In 1967, NASA's Mariner 4 spacecraft was cruising through the solar system, not far from Earth, when something unexpected happened. Right: an artist's rendering of Mariner 4 in space. Credit: NASA. Left: What does a piece of space dust look like? This picture shows one that is only 10 microns across. It was captured by a U2 aircraft in the stratosphere. Above: the radiant of the June Bootid meteor shower. Visit Spaceweather.com for updates about this year's June Bootid meteor shower. Missions to Mars: Mariner 4 -- (JPL) See also the Mariner 4 entry in the NSSDC master catalogue of spacecraft. 7P/Pons-Winnecke -- (Cometography.com) the source of the June Bootid meteor shower. See also the comet's 3D orbit from JPL. June Bootid meteors stream out of the constellation Bootes.